parts (findings) do not qualify as handmade. See below. 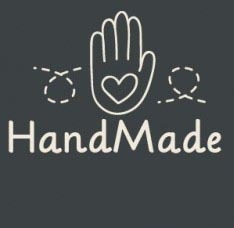 A7 23.3 Misuse of the terms “hand-made,” “hand-polished,” etc. (a) It is unfair or deceptive to represent, directly or by implication, that any industry product is hand-made or hand-wrought unless the entire shaping and forming of such product from raw materials and its finishing and decoration were accomplished by hand labor and manually-controlled methods which permit the maker to control and vary the construction, shape, design, and finish of each part of each individual product. Note to paragraph (a): As used herein, “raw materials” include bulk sheet, strip, wire, and similar items that have not been cut, shaped, or formed into jewelry parts, semi-finished parts, or blanks. Casting CAN NOT describe as handmade!